China is looking to enhance its soft power and global influence with the three-day Exposition on China's Indigenous Brands that commenced in Shanghai on Thursday. The event, themed with "China brand, world sharing", is designed to help domestic companies build influential brands to enhance the country's overall competitiveness and help in China's transition toward a consumption-driven economy. At the same time, it will also highlight China's support of the real economy, stress on intellectual property rights, and resolution to boost the development of domestic companies in a more open manner. Spread over 25,000 square meters, the exposition has attracted more than 600 domestic companies, including State-owned enterprises such as China National Nuclear Corp and China Aerospace Science and Technology Corp, as well as privately-owned companies such as China's largest online travel agency Ctrip and Qingdao-based home appliances giant Haier. In late April last year, the State Council approved the China Brand Day, which will fall on May 10 every year. Vice-Premier Hu Chunhua said at the opening ceremony of the exposition that China has witnessed the rise of a number of domestic brands with the country's economic growth and increased competitiveness in the global market. "We have seen the renovation of century-old domestic brands and the rise of younger brands thriving in the international market after the reform and opening-up, which can be largely attributed to Chinese companies' increased brand awareness," he said. According to State Administration for Market Regulation, there were more than 14.9 million registered trademarks by the end of last year, which outnumbered the rest of the world for 17 consecutive years. "Chinese consumers now put more emphasis on individuality and diversity, attaching more importance to experiences. More efforts on brand image building can ensure the more efficient supply of products. As the economic ties between different economies are strengthening with globalization, we can provide more choices to global consumers," he said. Shanghai Mayor Ying Yong said that one of the major purposes of holding the exposition is to enhance Chinese domestic brands' global awareness and influence. According to the Global 500 list released by British brand valuation consultancy Brand Finance in February, 22 Chinese companies were among the top 100 companies in the world in 2017, compared with 16 in 2016. Shanghai Party secretary Li Qiang said that Chinese brands should demonstrate their new image to the world with the help of this exposition. They should embrace the market in a more open manner and seek possible global cooperation at the show. 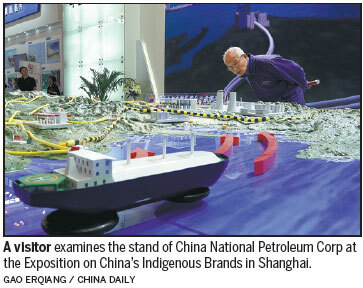 "The brand is the comprehensive demonstration of the competency of a country, a region and even a company," he said. "Shanghai will make all efforts to promote the four brands of the city, which are manufacturing, services, shopping and culture."